The Quiet Pro Keyboard from Matias uses quiet mechanical keyswitches incorporating Matias' new Quiet Click technology. These high quality mechanical keyswitches feel better and help you type faster without the added noise. The Quiet Pro has been designed for comfort, strength, and better resistance to crumbs and dust. In addition, the keys are sculpted (not flat) for better key accuracy and maintaining your hands on the home row. 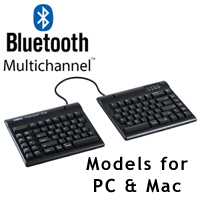 Included is a 3-port hi-speed USB 2.0 hub and special Anti-Ghosting circuitry, which enables you to type as fast as you need to without dropping letters. Available in models for Mac or PC. Note:The Quiet Pro Keyboard has not only won the Gold Medal for "best product/service in its category" from the UK's Web User publication (for the PC model), but also received from Macworld Magazine 4.5 out of 5 stars (for the Mac version). The Standard One Keyboard from Matias allows you to easily type text on your iPhone (or iPod Touch, iPad, Android phone (3.0), or tablet) or switch with one key to your PC or Mac. 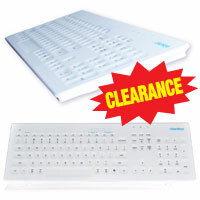 The full-size design means you also have all the functionality of a standard keyboard. 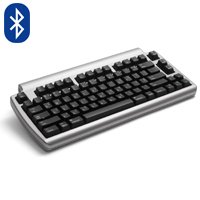 No batteries are required, even though the keyboard will connect wirelessly via Bluetooth to your iPhone (it also works with any device that can connect to a Bluetooth keyboard). In addition, you can control various screen properties on your iPhone by the function keys, for example, brightness, audio, navigation, etc. The keyboard even includes a built-in USB 2.0 hub. Designed for both Mac and PC. 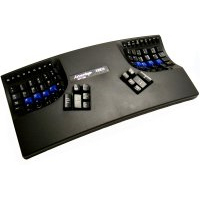 The Advantage Pro is the top-of-the-line model of the Contour line of keyboards from Kinesis. Its sleek modern appearance is the result of a double coating of protective clear gloss on top of a metallic silver coating. 'Under the hood' it features a second memory chip which permits longer macros and a hidden memory locking switch to prevent accidental or unauthorized programming changes. An option to bundle the Single Action Footswitch accessory at a discounted price is also available. 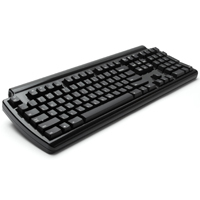 Le clavier Advantage Pro est la plus haut du gamme de produit Contoured par Kinesis. Ce que la plus part des gens voit premier est l`allure élégant, moderne du clavier qui découle de la couche protectante qui est transparent, lustré par dessus la couche métallisée gris. L'une des charactèristique `Sous le capot` est d`avoir une deuxième puce mémoire qui permet d`avoir des macros plus longues et un switch caché qui bloque la mèmoire pour pas avoir des changements accidentels, ou non autorisation des changement du programmation. Un option de groupé l`accessoire Single Action Footswitch a un prix de rabais est aussi disponible. 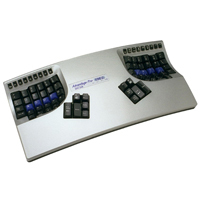 The Dvorak Pro Keyboard is the only standard, conventional keyboard which offers a hard-wired switchable QWERTY-DVORAK dual-legended layout. 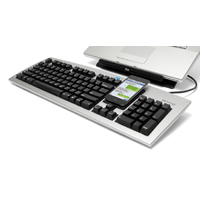 Unlike software solutions which require configuration and fail to function during the login process, the Dvorak Pro is Plug and Play and provides instant access to the QWERTY or DVORAK layout with the simple press of the QWERTY Lock button at the top of the keyboard which also indicates whether you are in DVORAK or QWERTY mode. The DVORAK legending is in the bottom left of each keycap, and the QWERTY legending is in the upper right of each keycap. The Dvorak Pro features mechanical keyswitches that use Matias Quiet Click technology. These keyswitches provide the superior tactile feedback and high performance, faster typing speeds associated with mechanical keyboards but without the associated "click - clack" sound. The keyswitches are rated at 50 million keystrokes and provide greater than normal resistance to dust and debris. The keycap legends are laser etched and will not wear off even with intense use. 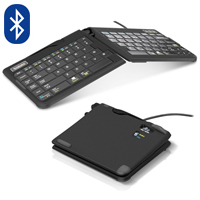 The keyboard also includes an embedded 3 port USB 2.0 hub. 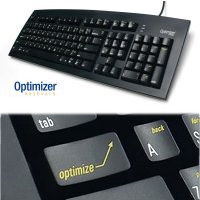 The Optimizer keyboard uses a 'layer shift' Optimize key (located where the CAPS LOCK is usually) to provide access to many commonly used functions and combination keystrokes. 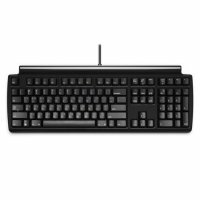 Arrow Keys, Home, End, Page Up, Page Down, Equal (=) on Number Pad, Cut, Copy, Paste, Enter, Esc, Delete, Backspace, Erase Word, Select, Select All, Select Word, Move by Word, Web Browser Back, Forward, Launch Calculator, Caps Lock, Num Lock. Le clavier Optimizer keyboard utilise un clé 'layer shift' Optimize (situé ou ce que le clé CAPS LOCK est d'habitude) pour founir l'accès de beaucoup de fonctions qui sont plus utilisé aussi que des touches combinaisons.